1. You can now edit source segments in .doc(x) and .ppt(x) filetypes. 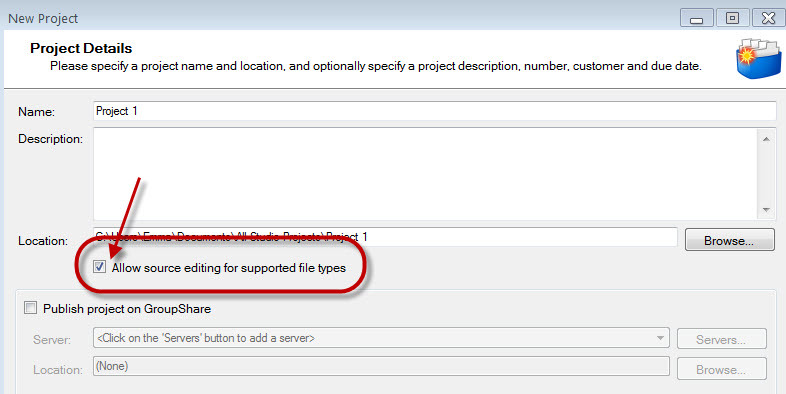 Make sure the option is activated when you open a project because it is disabled by default. If you discover that it is disabled half way through a translation, you can go back and enable it. Note: You can’t use it if you have been sent a package in which source editing has been disabled, so you may need to advise your project managers about this new option if they haven’t spotted it themselves. Edit the source by changing the focus to the source segment (F6) and clicking Alt+F2. Editing source segments has been the 4th most-voted idea on the ideas.sdl.com site. The new feature also ties in nicely with the 1st most-voted idea, which is to merge segments over paragraph breaks. Although you still can’t merge segments that are split by a hard return, there is now a workaround. By editing the source segments, you can cut the text (Ctrl+X) from the second segment and paste it (Ctrl+V) into the first segment. Result: a pseudo-merged segment! 2. 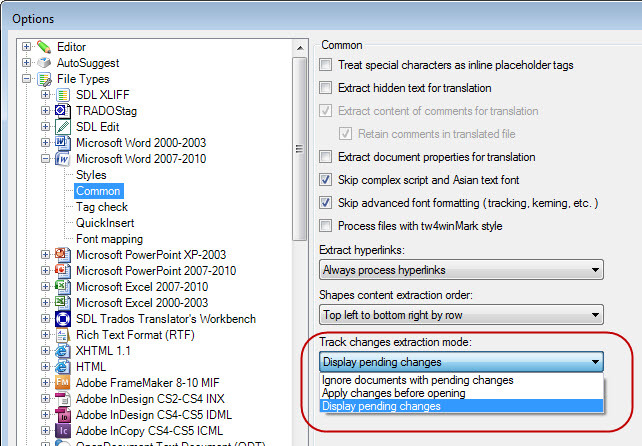 Track Changes made in a source Word document (.docx) can now be shown in the Editor window in Studio. This is a very interesting new feature for translators who work in regulated industries where changes in documents have to be controlled. I will look at this option in more detail in a future post because it deserves a separate entry. However, most translators will be happy to continue with the default behaviour, where track changes have to be accepted before a document is processed in Studio. 3. Comments that you add in the Editor window can now be seen when you open a target file in .docx format in Word. This is a great time saver! Gone are the days when I had to jot down comments to clients with a pen and paper and then transfer them to the target file. Note: The severity level of the comment (FYI, Warning or Error) isn’t shown in the Word document. 4. You can now decide whether to make Autosuggest case sensitive. You’ll get a lot more results from Autosuggest if you disable the case sensitive option. The drawback is that the suggestion will be added to your target segment as it appears in the list and so you may have to change the upper/lower case to make it fit your sentence (don’t forget that you can use Shift+F3 to change the case of selected words/segments, the same way you can in Word). Also, you can now sort the list of Autosuggest results by shortest or longest suggestions or by alphabetical order. 5. SDL XLIFF Converter is now an integrated part of Studio. If you work with reviewers who don’t have Studio, no doubt you’ll be familiar with the SDL Exchange app called SDL XLIFF Converter. It converts .sdlxliff files to a bilingual table format in Word, where you can make changes and import these changes back into the .sdlxliff file afterwards. Instead of downloading this as a standalone application, you can now access it in Studio under Files>Export for external review. 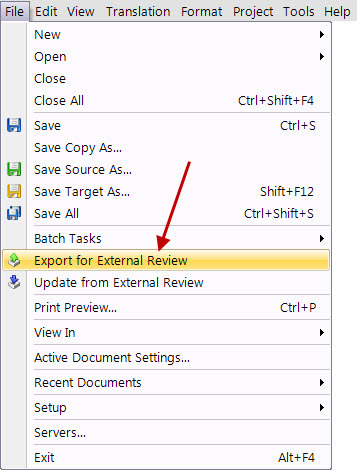 If you want to know more about SDL XLIFF Converter, check out Jayne Fox’s article on How to review a translation in MS Word and import changes to Trados Studio. 6. There are several new shortcuts in SP2. I expect you know that it has always been possible to toggle between source and target concordance using F3 and Alt+F3; between source and target segment focus with F6; “save target as” using Shift+F12; and apply results from the translation results window using Alt+1, etc. Don’t forget that you can also reassign shortcuts easily by going to Tools>Options>Keyboard shortcuts. Save terms you add to a termbase with Ctrl+F12. Use Ctrl+Alt+F3 in the Concordance context menu to “Insert into document” after highlighting a Concordance search. Assign shortcuts to switch to Projects/Files/Reports windows. 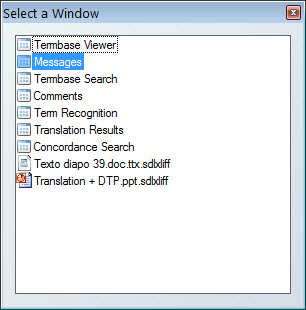 Switch between source/target with F6 in concordance and Translation Results windows. Switch between Messages/Translation Results/Concordance by clicking Ctrl+tab (see image below). All in all, many of the ideas that users have put forward over the past couple of years have now been implemented. The only feature I would still really like to see is a choice of horizontal/vertical layout in the Editor window. I must admit I’ve got used to the side-by-side view after adapting from the top-bottom version in Workbench and Tag Editor, but it would still be nice to have the choice. Why not have your say and contribute to the 5th most-voted idea on the SDL ideas website? The upgrade to SP2 is free for Studio 2011 users. You’ll find it in My Account>My Downloads on the SDL website. If you don’t have Studio 2011 at all, then maybe now is the time to dive in and go for gold – Tom Daley style. 19 September 2012. Edited to add: SDL has just released an update to SP2, which you can read about in my post called SDL Trados Studio 2011 SP2: Updated release. This entry was posted in 2. Beyond the Basics, SDL Trados Studio and tagged SDL, SP2, Studio, Studio 2011, track changes, Trados. Bookmark the permalink. I had the opportunity to use the tracked changes feature this afternoon and was quite excited at the prospect and then was more excited when it worked flawlessly. This is going to revolutionise the way we approach amendments to legal documents. I agree, Ann. Using tracked changes in source segments means we can now process certain files much more efficiently than before. Thank you Emma, an excellent summary! Emma – I just discovered your blog! Great writing! You may recognize me from the beta forum! Hi Anna, Great to see a fellow beta tester drop by! I am going to give our local translator group (CTA) a link to your blog too! I do a lot of supporting Studio 2011 for them and your blog could certainly come in handy! Hi, I’m trying to understand how to go about getting those comments in my target file… the only way I have found is to create a “file for review”… can you help? Thanks!!! If you’ve got problems with comments in the target file, first, make sure you’re working on a .docx, not .doc, and second (and more likely), SDL brought out SP2R in September and temporarily disabled this feature. So if you’re using the most up-to-date version you won’t be able to retain comments in your target file. I was very disappointed with this setback and in fact rolled back to an earlier version to make use of the feature. If you want to read more about it, check out my post on SDL Trados Studio 2011 SP2: Updated release, and read through the comments there. Emma, how much can I thank you for this?! You made my life easier. I wonder, though, how you manage to keep a blog beside translation. I’m sure you’re a great time-manager. You go, girl!